Here at Touchstone Heating and Air Inc we pride ourselves on clean, efficient and professional installs for our clientele. 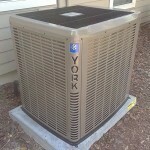 We recently replaced an old A/C unit with a brand new York A/C unit with a SEER rating of 18. Check out the photos below for a peek at the clean new A/C units available from York and installed by your favorite Gainesville, FL heating and air professionals at Touchstone Heating and Air Inc. Schedule your install/replacement today and start reaping the benefits of a new and more efficient A/C system! Are you concerned about the cooling performance of your AC? Are you tired of paying to repair your AC almost constantly? While there’s no doubt that a new AC system is beneficial to your home comfort, it can be difficult to know precisely when to replace or continue to repair your existing system. This is a common source of confusion among homeowners, but it doesn’t have to be. The first step in this process is professional advice. Understanding what your options are is critical to the decision, and that’s where a qualified technician comes in handy. He will work with you to ensure that your cooling system, whether it’s repaired or replaced, restores your comfort, taking into consideration the condition and age of your AC, as well as your budget. Call Touchstone Heating & Air today for comprehensive air conditioning services in Gainesville, FL. Age: If your AC is old, at the very least you should consider the possibility of replacement. Unfortunately, even the most well-built systems cannot last forever, and it’s good to know where your AC stands. With routine maintenance and pro installation, your AC will give you years of solid cooling performance, but there may come a time when it makes more sense to replace it with a new system. Frequent repairs: If your AC is becoming more and more expensive to repair, then you should probably consider replacing it. This makes a lot of financial sense. You don’t want to be propping up an obsolete and damaged air conditioner when you could invest in your future comfort with a new AC. Energy efficient: Another consideration is energy efficiency. You need to make sure that your AC, whether you decide to repair or replace, is energy efficient. While we cannot control the cost of energy in our area, we can control how we use it, and replacing your AC with a new highly energy efficient unit is a great way to save in the long term. Call Touchstone Heating & Air today for comprehensive Gainesville, FL air conditioning services, from replacement to repair. In order to stay comfortable in your home you probably run your air conditioning system on a daily basis. Using your air conditioning system that much can cause your utility bills to increase. Every homeowner is looking for ways to decrease their energy usage without sacrificing comfort. The Lake City, FL air conditioning experts at Touchstone Heating and Air have years of experience working with countless customers to help them increase the efficiency of their home. We thought it would be a good idea to put together some of the best ways that you can do that. One of the best ways to increase the energy efficiency of your home is to get your insulation inspected and possibly replaced. Over time, your insulation can wear out, develop holes, start to rot and generally decline in quality. This allows heat from your attic to seep into your home which means that your AC has to work harder to keep your home cool. The insulation repair, installation and replacement experts at Touchstone Heating and Cooling can work with you to replace your current insulation with newer, more efficient types. If you have a heat pump or a central air conditioning system, then you have a series of ducts in your home that carry the cooled air into each of your rooms. If those ducts are leaking it can cause up to 30% of that air to leak outside; which is obviously very wasteful. We offer fast and quality duct sealing services for all different types of ductwork. If your air conditioning system is old or if it has started to require more frequent repairs it might actually make more sense to replace it. The air conditioning repair and replacement specialists at Touchstone Heating and Cooling can help you find the perfect system for your home that will meet your needs and your budget. Not only will you likely be able to avoid those repairs, but a new AC system will be much more efficient than your old one. Call the Lake City, FL air conditioning efficiency experts at Touchstone Heating and Cooling today to talk with one of our friendly technicians about any of the AC needs that you might have. Short of total breakdown or hot air blowing through your ductwork, it can be difficult to tell when you need professional Gainesville, FL air conditioning repair service. But with a little vigilance and know-how, you’ll be able to spot some of the more common AC problems that can occur during the cooling season. It’s critical that when you catch a problem, you call a technician to take care of it. Allowing problems to fester can lead to increased damage and energy inefficiency. In this post, we’d like to explain some of these common problems that tell you that professional air conditioning repair service is necessary. Call Touchstone Heating & Air today! Inadequate cooling: This is a common problem with a great variety of possible causes. Often, it’s a number of problems in combination. Inadequate cooling can come down to airflow, mechanical deficiency, or even low refrigerant. Your AC was “charged” during installation, which means that it has just the right amount of refrigerant circulating through the compressor and coils to effectively and efficiently remove heat from your home and send cooled air into your home. However, if you have even a microscopic leak in one of your coils or in the copper lineset, then it can lead to inadequate cooling, as well as other problems. Frozen evaporator coil: This is often due to an airflow issue. If you have a clogged air filter in your air handler, then much of the cool air will be trapped at the evaporator coil and this causes it to freeze over. Once this occurs, it usually tends only to worsen and may eventually lead to system shutoff. Dirty condenser coil: Your condenser coil is responsible for dissipating the thermal energy of your home into the outside air, once it has been heightened by the compressor. Because of the location of your condenser coil, however, it is subject to encroaching vegetation and the accumulation of dust and debris. Dirty coils lead to energy inefficiency and premature system failure. We hope this brief guide helps. 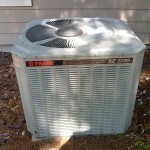 Call Touchstone Heating & Air for comprehensive Gainesville, FL air conditioning repair services! 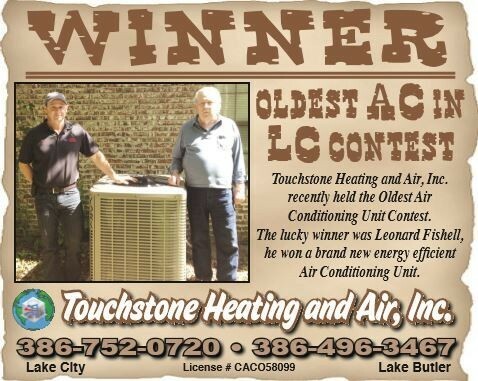 Congratulations to Leonard Fishell, winner of Touchstone Heating and Air, Inc.’s “Oldest AC in LC” contest! Leonard won a brand new energy efficient AC unit. Call or contact us today for more information about high-efficiency AC systems.